Our inaugural Innovator 25 class in Asia-Pacific provides a unique glimpse of our industry’s future, shining the light on those individuals who are reshaping influence and engagement in an era of dramatic marketing and communications disruption. The highest proportion of our inaugural class are based in Hong Kong (33%), followed by China (Beijing and Shanghai) and Singapore (25% each) and Tokyo (12%). Other markets represented are Bombay, New Delhi and Sydney. 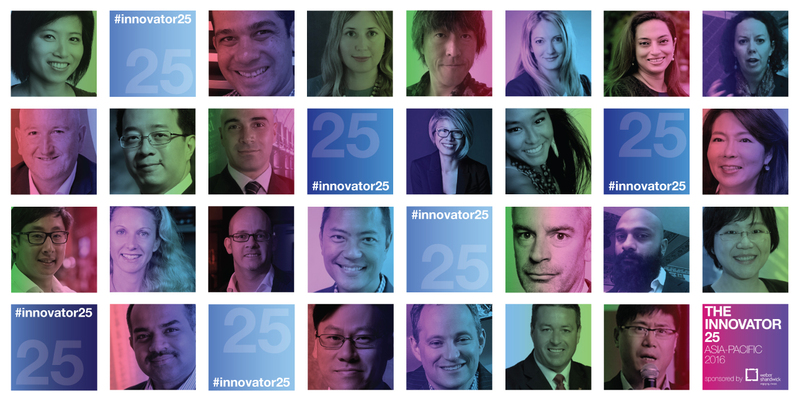 Each of the Innovator 25 profiles explores their views towards the state of industry innovation, while also providing unique insight into the habits and learnings that drive our class of innovators. Many, for example, prefer the evening when it comes to looking for inspiration. "In the middle of the night when I suddenly wake up and still remember a brilliant idea comes to my dream" said SPRG's Richard Tsang. Almost as many, among them Anna Choi from Siemens, picked the early morning: "Early morning when I wake up with sunshine and the peace of mind, all good ideas and thoughts come right out of me." Weber Shandwick's Darren Burns, meanwhile, hedges his bets, opting for both: "Sunrise and sunset. Sunrise represents the prospect of a new, full and exciting day. Sunset is a time to reflect on what was and what could have been." Several members of the group picked specific mentors, while others instead pointed to collective sources of advice, whether clients, staff or, in the case of Daylight Partnership's David Ko, "anyone who is not afraid to be different." And almost everyone believes an open-minded approach, often requiring travel, new people and new experiences, is the best way to find inspiration. "I talk to the local cornershop owner. I buy things you wouldn't imagine. I people-watch in bars across the world. I play with my dogs," said Edelman India creative director Ashutosh Munshi. "I look at what brands are doing and where technology is heading. Because the meeting point of creativity and technology is where the magic happens. I dream and wake up and make notes and dream again." 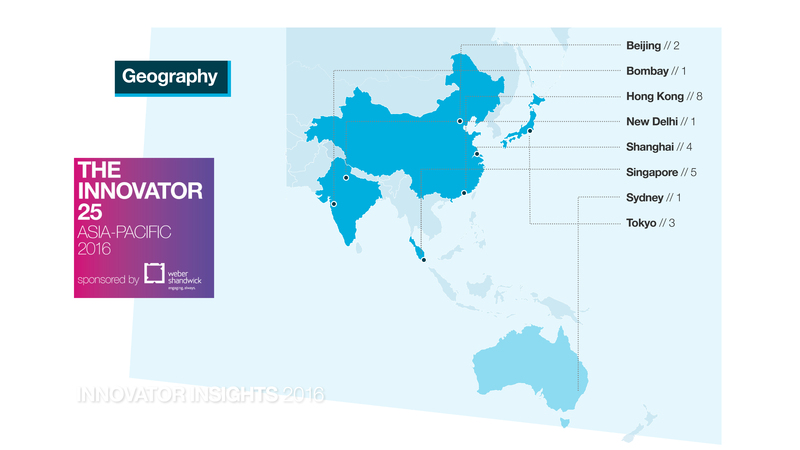 There was a broad range of opinion when respondents were asked to name their most innovative place in the world. A few chose Silicon Valley, while others preferred Asian locations, among them BlueFocus' Oscar Zhao (Beijing and Shenzhen), Golin's Calvin Wong (Japan and China), WPP's Tori Rappold (Shanghai), Dentsu's Tadashi Inokuchi (Tokyo), and Shiseido's Zaheer Nooruddin (India). "Walk into any junior school and listen to kids," added Steve Monaghan from AIA. "Exponential creativity!" 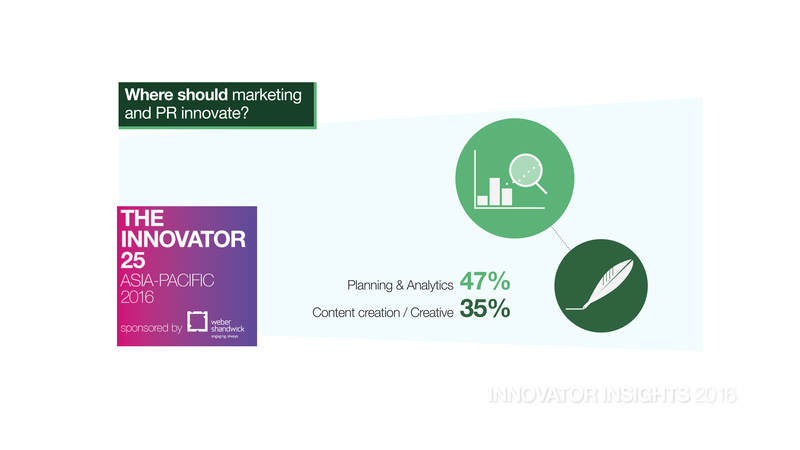 When it comes to innovation, marketing and PR have the greatest opportunity to make an impact around planning and analytics, say 47% of our innovators. Just over a third, meanwhile, point to creativity and content. 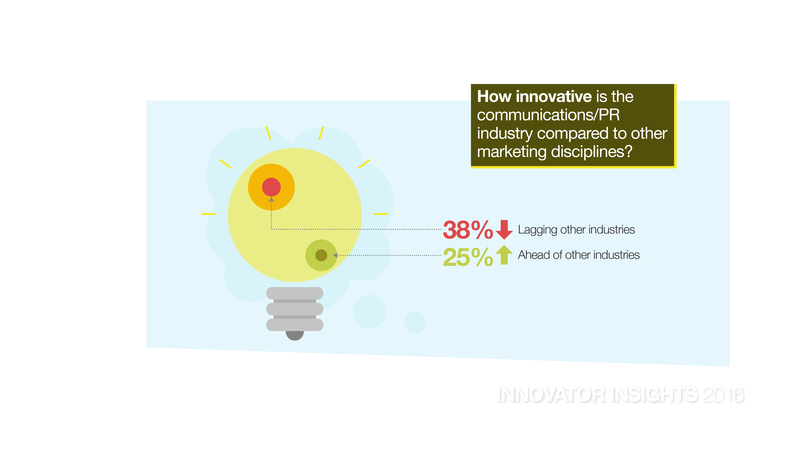 38% thinking PR is lagging other marketing disciplines in terms of innovation, while only 25% think the PR industry is ahead. 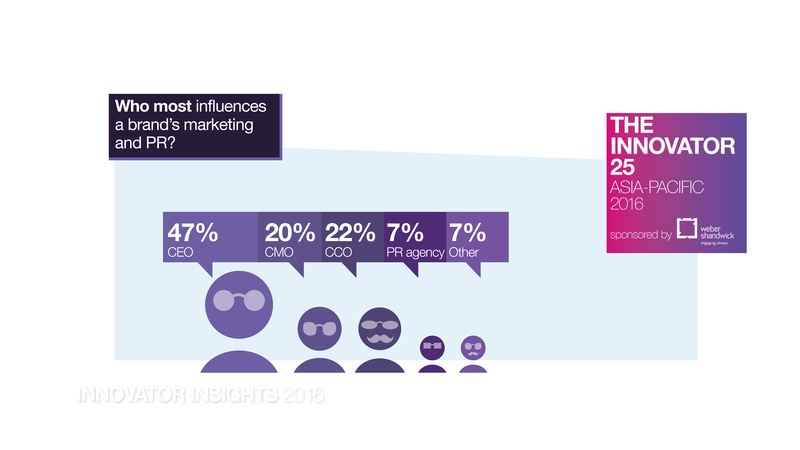 When asked who most influences how innovative a brand’s marketing/PR, the CEO reigns supreme, with 47% of the vote, ahead of the CCO (22%) and CMO (20%). 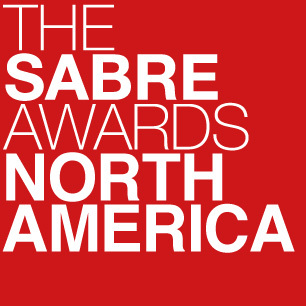 Which brands and agencies do they find most innovative? 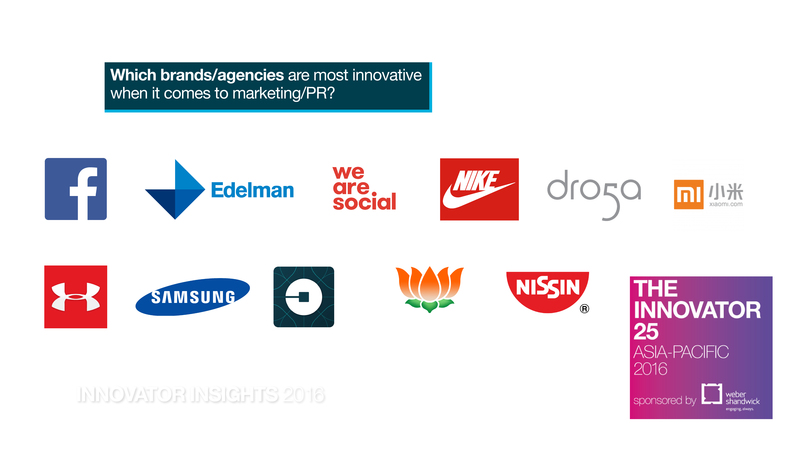 Many of the usual international suspects — Facebook, Nike, Under Armour and Uber — figure, along with Asian brands such as Nissin, Samsung and Xiaomi,and agencies Droga5, Edelman and We Are Social.